Some insist that God alone can forgive sins; however, Jesus didn't insist on this! Some say "only God can forgive sins;" however, what does Jesus say? People who insist that only God can forgive sins apart from man are followers of the Scribes, who accuse Jesus of blasphemy. 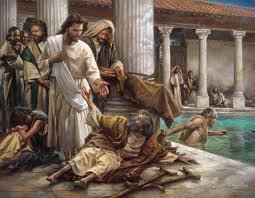 Jesus breathed on the Apostles and gave them the power to forgive and retain sins. My question for those of you who insist that "Only God can forgive sins" apart from man is this. Why do you follow the Scribes who oppose Jesus and accused him of blasphemy, Mark 2:6-7? Wouldn't it be better to follow Jesus who gave the Apostles the power to forgive and retain sins? NO PLACE IN THE ENTIRE NEW TESTAMENT DOES JESUS OR THE APOSTLES SAY THAT ONLY GOD CAN FORGIVE SINS!!! On person, debating on Facebook, cites Mark 2:7 as proof that confessing sins to a priest is wrong. He goes on to say; "ONLY God can forgive sins, and Christ, being God, has the power to do so as well!" Let’s give him credit for getting a couple of things correct. He said God can forgive sins and Christ is God. This is correct. And he is saying in reference to sin, God has the power to forgive sins, correct. He only gets it wrong when he says ONLY God can forgive sins and then cites Mark 2:7 as a proof text; “Why does this man speak this way? He is blaspheming. Who but God alone can forgive sins" (Mk 2:7)? When the statement is made "Who but god alone can forgive sins", I always ask, who in the Bible made this statement, was it Jesus or the Apostles? To this question I usually get blank stares; very few can answer this question. The answer is neither. When the statement is made "Who but god alone can forgive sins", I always ask, who in the Bible made this statement, was it Jesus or the Apostles? This of course begs the question. if Jesus didn’t say it and the Apostles didn’t say it; who said Mark 2:7? They leave out Mark 2:6; (the context) "now some of the SCRIBES were sitting there asking themselves." Mark 2:6 is left out because this clearly shows that it was neither Jesus nor the Apostles, but it was the SCRIBES (who opposed Jesus) who made the statement; "God alone can forgive sins". And so people who believe that God alone can forgive sins are not followers of Jesus, but followers of the people who opposed Jesus. Now some of the scribes were sitting there asking themselves, "Why does this man [Jesus] speak that way? He [Jesus] is blaspheming. Who but God alone can forgive sins" (Mk 2:6-7)? Notice, it was the scribes who first accused Jesus of BLASPHEMY, and then the Scribes said; Who but God alone can forgive sins? My question to people, who want to use this for a proof text for God alone forgiving sin, would you also accept the phrase before it, where Jesus is called a blasphemer? There is a reason Jim and others do not bring up (the context) verse 6. Once you do, you can no longer suggest that this is coming from Jesus and the Apostles. And then with closer scrutiny you realize that these same scribes were accusing Jesus of blasphemy. 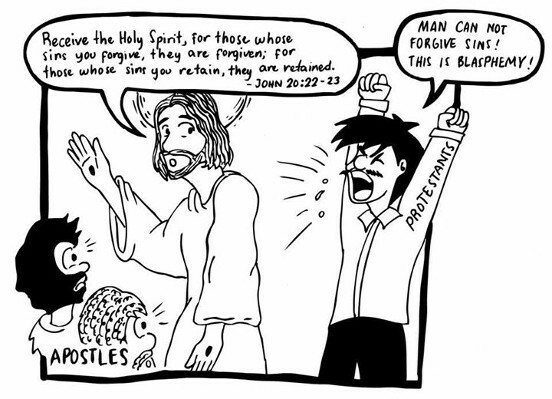 The scribes (who apposed Jesus) and Evangelicals of today claim "God alone can forgive sins" (Mk 2:7). And since Jesus didn’t say "only God can forgive sins", what did He say if anything? Does Jesus allow for man involvement in the confessing of sin? The answer is yes. Jesus gave the power to the Church and specifically the Apostles. "Peace be with you. As the Father has sent me, so I send you." And when he had said this, he breathed on them and said to them, "Receive the holy Spirit. Whose sins you forgive are forgiven them, and whose sins you retain are retained” (Jn 20:23). “We receive ABSOLUTION AND FORGIVENESS from the CONFESSOR, as from the confessor, as from God Himself, and in no wise doubt, but firmly believe, that by it our sins are forgiven before God in Heaven." Many reject this notion from Jesus. So strong are their man-made traditions that they do not believe the Apostles had the power to forgive and retain sins even though Jesus gave them this power! There will always be people who will insist that only God can forgive sins with no involvement of the Apostles. However, they are the followers of the Scribes, who accuse Jesus of blasphemy. As for me, I follow Jesus and He was the one who gave the Church through the Apostles the power to forgive sins; “Whose sins you forgive are forgiven them, and whose sins you retain are retained” (Jn 20:23).